Zimmer Biomet Holdings, Inc., a global leader in musculoskeletal healthcare, announced the completion of the first surgical case utilizing its Comprehensive® Augmented Baseplate, which received FDA clearance on January 3, 2018. The case was performed by John W. Sperling, M.D., an orthopaedic surgeon at Mayo Clinic, who specializes in shoulder surgery. 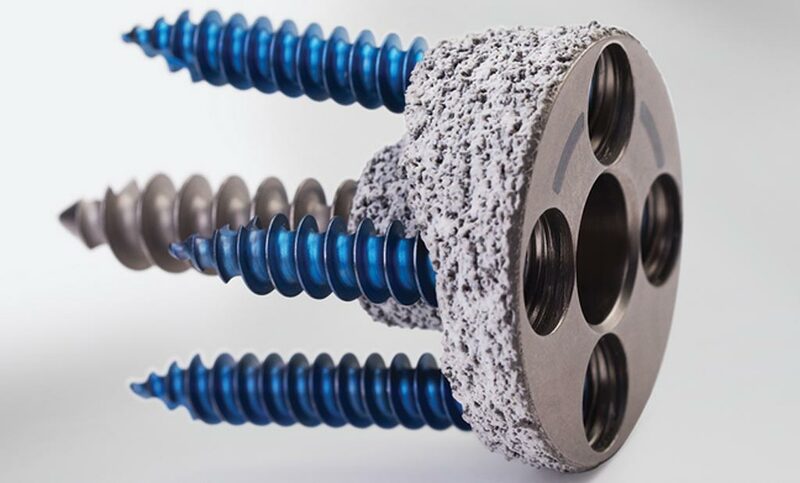 The Comprehensive Augmented Baseplate complements the Company’s Comprehensive® Reverse Shoulder System by offering an alternative to bone grafting and eccentric reaming for patients with glenoid defects undergoing shoulder reconstruction. This newly cleared baseplate boasts a simplified circular design at three augment heights (3mm, 5mm and 7mm buildup), allowing for augment placement in any orientation to accommodate various unique bone anatomies. Its circular design also allows bone ingrowth into the rim of the baseplate for optimal fixation. The Comprehensive Augmented Baseplate is a component of the Comprehensive Reverse Shoulder System, a next-generation reverse shoulder prosthesis engineered to offer high-quality intraoperative flexibility and clinically proven technologies. The system aims to minimize the potential challenges of removing well-fixed humeral stems by allowing conversion to a reverse shoulder using any of the existing Comprehensive stems. Additionally, the Comprehensive Augmented Baseplate leverages Mayo Clinic’s patented methodology for the optimization of shoulder arthroplasty components developed by Dr. Sperling at Mayo Clinic, Rochester, Minn., to provide relevant sizing for a conservative approach to bone removal in order to preserve bone stock if a future revision procedure is necessary. “The new Augmented Baseplate rounds out Zimmer Biomet’s Comprehensive Shoulder portfolio and provides solutions that help surgeons with difficult glenoid deformity cases,” said Orsa Britton, Vice President and General Manager of Zimmer Biomet’s global Extremities business. More on the small bone and joint orthopedic devices market in the U.S. can be found in a series of reports published by iData entitled the U.S. Market Report Suite for Small Bone and Joint Orthopedic Devices. This report covers the following market segments: shoulder reconstruction devices, elbow repair devices, hand & wrist devices, foot & ankle devices, plate & screw devices, staple fixation devices and external fixation devices. The iData series on the market for small bone and joint orthopedic devices covers the U.S., India, Japan, and China. Reports provide a comprehensive analysis including units sold, procedure numbers, market value, forecasts, as well as detailed competitive market shares and analysis of major players’ success strategies in each market and segment. To find out more about small bone and joint orthopedic devices market data or procedure data, register online or email us at [email protected] for an U.S. Market Report Suite for Small Bone and Joint Orthopedic Devices brochure and synopsis.